Why Are Raw Frozen Diets Beneficial For Cats and Dogs? When it comes to pet food, raw frozen diets are unmatched due to the wholesome and balanced nutrition they provide for cats and dogs. These diets contain real meats, ground bones, vegetables and fats in their natural state. Since the food has not been overprocessed or overheated, they are highly digestible and pets absorb the nutrients, leaving a lot less poop for you to pickup! A raw frozen diet can improve digestion, help with allergies, strengthen immunity, improve your pet's coat quality and reduce inflammation. Raw frozen diets are the gold standard of pet nutrition for many pets but if your pet has any history of allergies or digestive issues, choose a hypoallergenic source of protein such as rabbit and transition slowly. If your pet is finicky or very sensitive, you can slowly introduce a raw frozen diet by starting with a companion product from the same brand in freeze dried form. 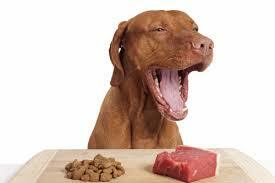 Examples: Instinct and Stella and Chewys offer the same ingredients in their raw vs freeze dried diets. Most pets love the taste of the freeze dried so you can start with small pieces and then include both raw and freeze dried in their bowl.